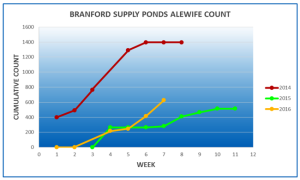 This year’s alewife run got off to a bit of slow start with no fish reported until April 12. Now, about a month later, we have already surpassed last year’s total! There were 211 fish counted at the fishway last week, bringing the season-to-date total to 627. We shall see what the next few weeks of warm weather bring. 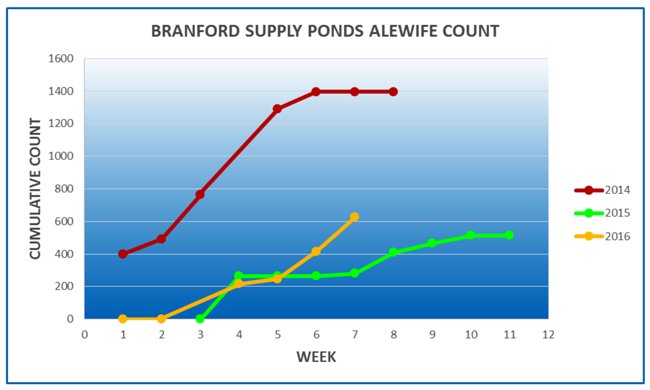 That, combined with this week’s rainfall, could boost this year’s alewife numbers even further. Friends and members of the Land Trust might be interested to know that World Fish Migration Day is May 21. This is an international celebration of migratory fish. There are various activities planned throughout the region, (more information will be available next week), but there will be open houses at the following fishways: Greeneville Fishlift (Norwich), Rainbow Fishway (Windsor), Haakonsen Fishway (Wallingford), Mianus Pond Fishway (Greenwich), and the Holyoke Dam Fishlift (Holyoke, MA). Staff will be on hand to show the fishway and explain how they work and help migratory fish. There are viewing windows at Greeneville, Rainbow, and Holyoke where you can see migratory fish swim past. You can RSVP and get more information about tours and events at the Holyoke Dam fishway by calling 413-772-2020 or emailing eryba@ctriver.org. New for this year will be a the Connecticut River World Fish Migration Floatilla, on Saturday, May 21, from 10:00 AM – 2:00 PM. This is a mass paddling event starting in Old Lyme on the Lower Connecticut River where you can gather in kayaks and canoes and paddle up the river, led by restoration specialists, biologists, and engineers. Click here for the invitation and check out the event’s webpage. Come on out and join the migratory fun at one of these events!